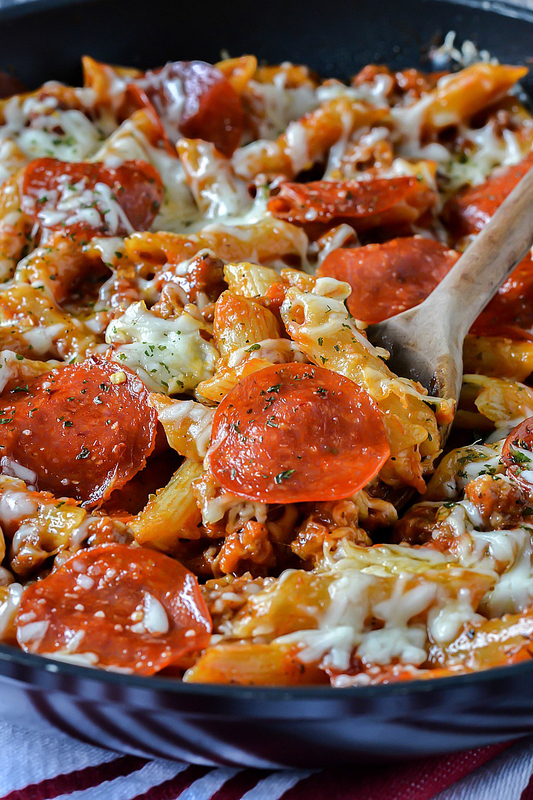 Everything you love about pizza and pasta combined into this delicious One-Pot Cheesy Pizza Pasta ready in about 30 minutes! Who doesn’t love pizza and pasta? They’re two of mine and my family favorites! If my kids could have pizza night every night they would. I personally love a big bowl of pasta. Bring on the carbs! Any pasta combined with any sauce you name it, if there’s pasta in it I’m bound to love it! 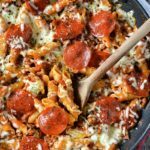 This delicious One-Pot Cheesy Pizza Pasta combines all the yummy flavors of pizza tossed with pasta and lots of cheesy goodness in one delicious dish! 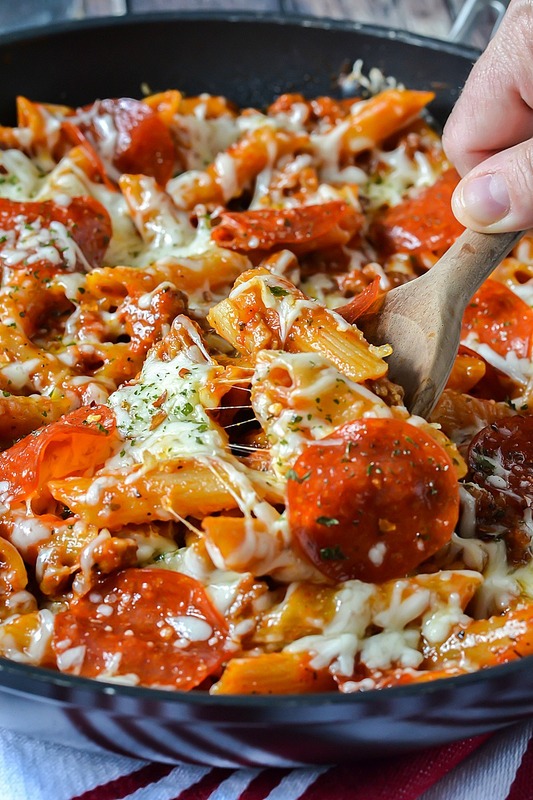 Not only is this One-Pot Cheesy Pizza Pasta so good it’s so easy too! One pot and about 30 minutes is all you need my friends to make this tasty dinner! I absolutely love meals like this and one-pot meals are pretty much a go to for me. Who wants to be cleaning up a ton of dishes after dinner? I certainly don’t! 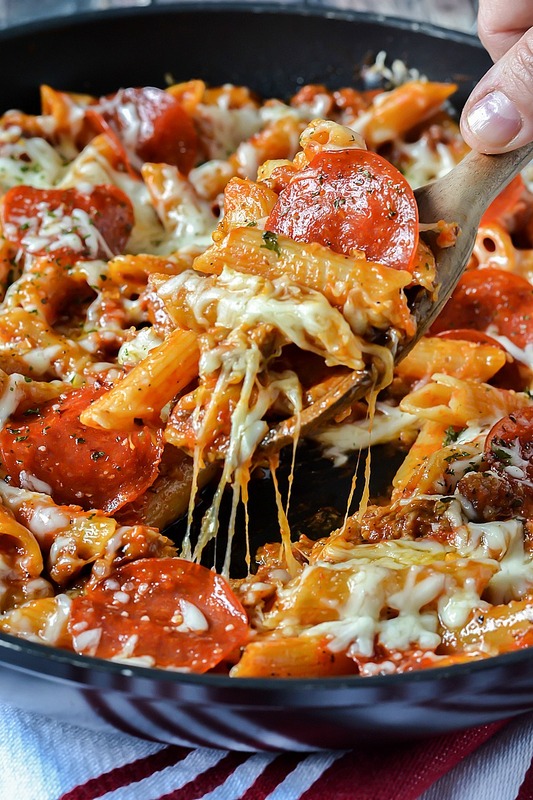 But if I can create a delicious meal in one pot without sacrificing flavor I’m all for it and that’s what this One-Pot Pizza Pasta is all about! Who wants to go through the trouble of boiling noodles in one pot, cooking meat and sauce in another. It’s more time consuming and more mess! I’m all about simplicity and by the end of the day I want to create a delicious meal that my family will enjoy like this without the hassle and extra clean up! If you’re scratching you’re head on what to make for dinner tonight let this be it! Toss together a salad and dinner is served! So easy and so good! This will definitely be a keeper and one that you’ll be adding to your dinner menu frequently. Heat a large oven safe skillet over medium heat. Add sausage and cook breaking up pieces until sausage is cooked thoroughly, about 8 minutes. Stir in halved pepperoni slices until heated through, about 2 minutes. Add in pizza sauce, water, penne, garlic powder, Italian seasoning, salt and pepper and stir together until combined. Reduce to a simmer and cook for about 15 minutes until pasta is tender. Turn off heat and stir in 1/2 cup cheese until blended. Sprinkle remaining cheese on top and then top with remaining whole slices of pepperoni. Transfer skillet to oven and bake for about 5 minutes until cheese is melted. Carefully remove skillet from oven. Sprinkle with some parsley and/or red pepper flakes before serving. 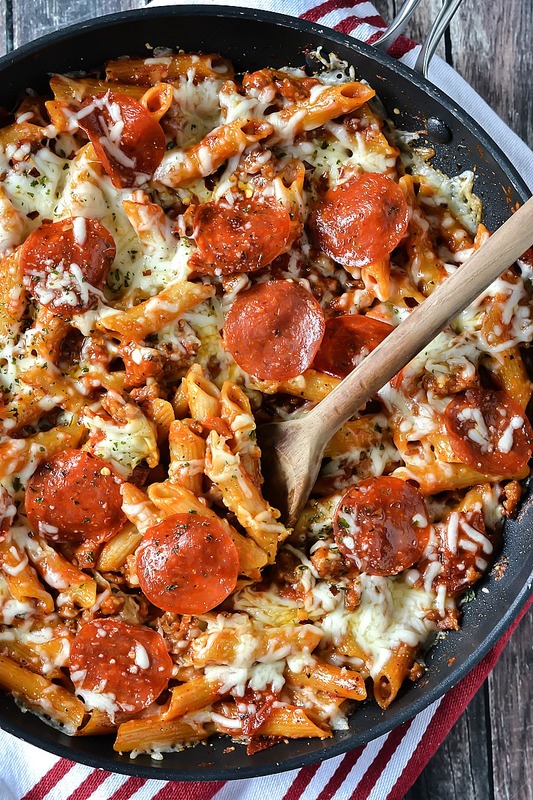 This is my dreamy recipe because it has two pizza flavors + pasta in one dish. Delicious!